I sat down to lunch with good company late February this year to taste the latest releases from Macedon Ranges winery “Curly Flat”, presented by owner and winemaker Phillip Moraghan, along with a couple of older wines for comparison. I did so with some anticipation because I’d had just a few wines from this producer and all had piqued my interest. Following the lunch I acquired a couple of bottles of the 2010 Pinot Noir and Chardonnay, so that I could return to them without the distractions of lunch, good company etc. Curly Flat Macedon Ranges Chardonnay 2006 If I needed any support for my view that the 2010 Curly Flat Chardonnay would benefit from further cellaring, this was proof positive; the colour showed little sign of its age. Rich but focussed, long, complex and textured, no single element shouting for attention. Older vintages have shown similar traits. I wish I had some in my cellar. If you are similarly challenged, buy the 2010 and exercise restraint. Phillip Moraghan established Curly Flat twenty years ago, and has year by year made incremental changes in the vineyard (the use of herbicides ceased some six years ago, for example) and learned from each vintage what the Macedon Ranges can produce. It’s aptly named “Curly Flat” which for those who aren’t familiar with the work of Melbourne’s Michael Leunig is the home of Mr Curly, whose reflections on the human condition have amused, challenged and informed readers of The Age newspaper for many years. Of the many observations to flow from Leunig’s pen, two stick in my mind: one is a man heading off to work in the morning, briefcase in hand with jumper leads from his car firmly clamped on his backside, and the other, a wistful character watching a sunrise on television while the real thing can be seen behind him through his living room window. Phillip Moraghan hasn’t needed jumper leads, and spends a lot of time in his vineyard where he concedes most of the winemaking is done. Curly Flat is full of energy and so are the vines and the wines. 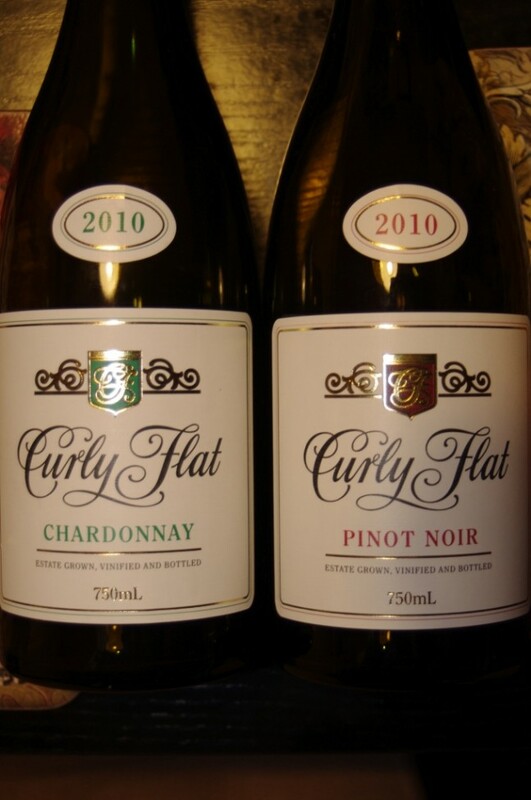 The current releases (the 2010 Curly Flat Pinot Noir and 2010 Curly Flat Chardonnay) are the best yet from this vineyard that I have tasted. Phillip Moraghan also offers Williams Crossing Pinot Noir and Chardonnay. The current releases, from 2011, are very good value, early to medium term drinking, and I have enjoyed many vintages of these wines. There are also older vintages and wines available in larger formats available from the vineyard. The pricing at all levels is very fair indeed for wines of this quality. Visit the website at www.curlyflat.com; better still take the one hour trip from Melbourne to the vineyard at 263 Collivers Road, Lancefield. Watch the Macedon Ranges as a force to be reckoned with in Chardonnay and Pinot Noir. It’s a cool region.